Conventional plain spine x-rays: The standard set of X-rays include AP and lateral X-rays of the area of the spine being imaged (cervical, thoracic, lumbosacral). Trauma series: Almost all centers forgo trauma series and use CT to image the spine because of the increased sensitivity of CT to the detection of cervical spine injury (1). 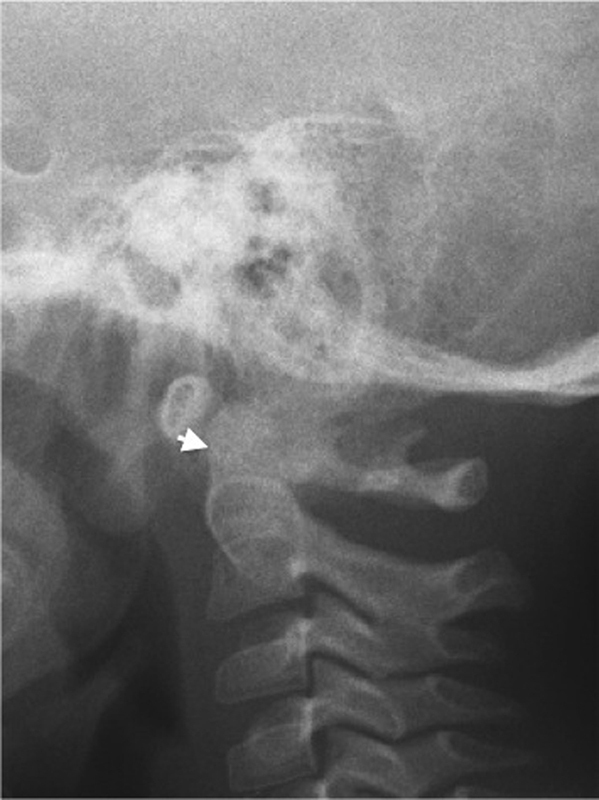 When required, a trauma series of the cervical spine should include an open-mouthed view to visualize the odontoid peg and a lateral film for visualization to C7 to adequately “clear” the cervical spine of traumatic injury and instability. In the event that these areas are not visualized or pathology is suspected, a targeted CT scan of the cervical spine is needed. CT is also indicated as the initial imaging modality of patients who have sustained trauma to the cervical spine and have a reduced Glasgow Coma Scale score or have required intubation. Oblique views: The use of oblique images has been superseded by CT scanning. In the context of trauma, additional views have been shown not to increase the sensitivity of plain films (2). Dynamic imaging: Lateral X-rays in flexion and extension allow assessment of the stability of the craniovertebral junction and cervical spine. 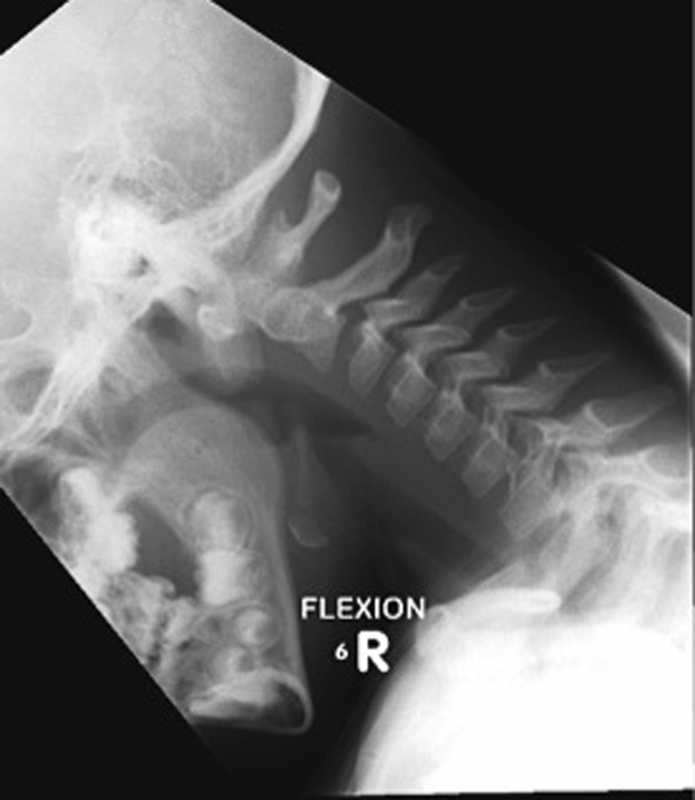 Flexion cervical spine X ray: In the flexed position, the atlas (C1) moves anteriorly in relation to the axis (C2). The atlantodental interval exceeds the normal range, indicating atlantoaxial subluxation. Assessment of C1-C2: Atlantoaxial subluxation is diagnosed if the distance from the posteroinferior border of C1 to the anterior border of the odontoid peg is greater than 5 mm. It is important to determine the reducibility of the subluxation in extension, as this will influence the choice of surgical technique. The measurements should only be made on high-quality X-rays with no rotation. The significance of subluxation needs to be interpreted in the context of the clinical symptoms or signs. The ADI is measured from the inferoposterior border of the atlas to the anterior border of the odontoid process of the axis. The upper limit of normal is considered to be 5 mm in childhood and 3 mm in adults.